Today we’d like to introduce you to Mary Rose Deraco. Mary Rose, please kick things off for us by telling us about yourself and your journey so far. I’ve been living in Los Angeles for the last 31 years. I grew up in the 70s in a small working-class town in upstate New York. My father worked for IBM while moonlighting as a musician. My mother was a public school teacher who minored in art. She was very artistic and always whipping up a gourmet meal or working on a knitting or ceramics project. My father’s ability to sing and play multiple instruments was entertaining but what struck me most, was the power of the music and how it brought joy into peoples lives. I was mesmerized by my both of my parent’s artistic qualities. I excelled in art classes and dabbled in music as a kid. I wrote songs with my musician friends and played upright string bass and guitar. My family encouraged a strong work ethic, so I decided to be practical and go to college for nursing. After all, I was great with people, empathetic (to a fault) and figured it would be a solid way to make a living. I put my interest in art, poetry, and music on the back burner and moved to Philadelphia to attend Hahnemann University where I studied nursing. When I graduated in the late 80s, the music scene in Los Angeles was on fire. So, like in the movie “Rock of Ages” I moved to LA with a group of my actor and musician friends. I was the only one with a “real job,” and after a few years of working nights as an Oncology nurse at LA Children’s hospital and making trouble around the LA music scene, I hit bottom with alcohol and depression. I found my way back to art through a woman’s recovery meditation retreat at my therapist’s ranch in Ojai. I don’t remember what I painted that day, but I clearly remember how I felt. The therapist led us through a creative visualization meditation exercise prior to painting. Her soft nurturing voice guided us to a beautiful place surrounded by the power and majesty of nature, this anchored me at my center. My spirit was lifted, and I was delivered to peace as I dipped the brush into the paint and pushed it onto the canvas. I felt fully awake in each moment with each stroke of the brush. My therapist was a recovering nurse and musician and played harp while we painted. I painted intuitively for over an hour. The time passed in a flash of a moment as I discovered my new escape. They say when you find your purpose in life or “dharma” one of the signs is that time becomes irrelevant. I felt free in my body and cleared of the negative energy that accumulated in my system from working with dying patients and abusing my body. The intuitive painting experienced filled me up so I could give back to others. The craving to drink was replaced by the craving to grow and nurture myself. 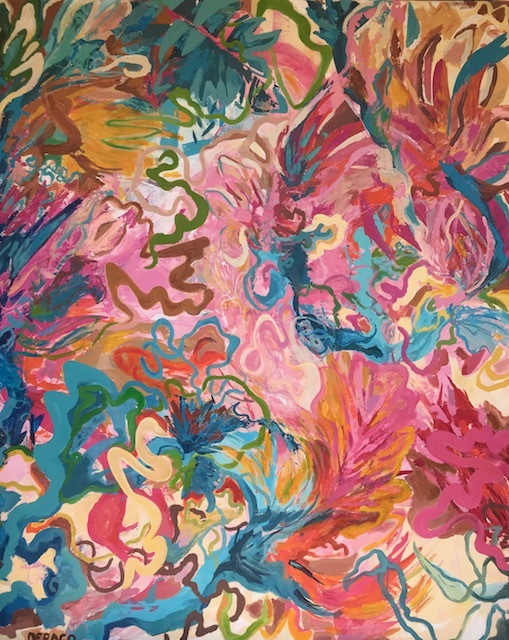 Since that day 25 years ago, intuitive painting has been my creative outlet and a metaphor for the way I move through my chaotic and colorful life here in Los Angeles. Just like my life in LA, I create a bold chaos of shapes, step back to get a broader perspective, then look for restful places to make connections from one interesting place to the next. 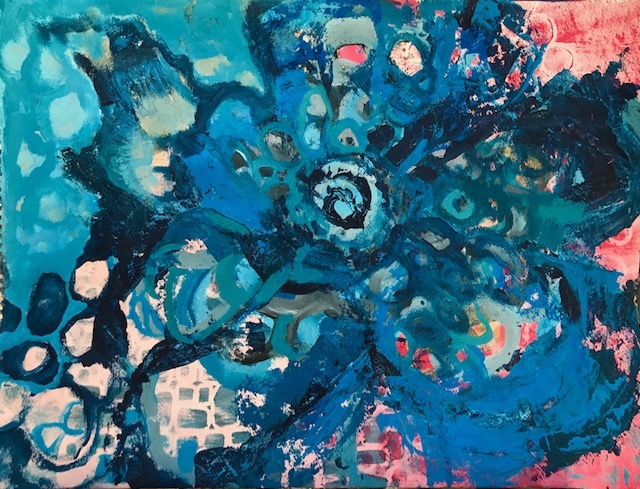 I realize now after painting for several decades, I hadn’t discovered an escape that day but that I had a spiritual awakening that has carried on to a sort of experiential healing. Just like humans need to breathe in order to stay alive, artists need to do art to thrive. Needless to say, I have been meditating, painting and in recovery for nearly three decades. Most of the inspiration for my work comes from a combination of nature, cultural influences, and inner struggles. I still paint intuitively but with a more disciplined focus on expressing themes through symbolism, line, shape, and color. I love to paint outdoors or in my studio. My studio is in my open garage and sits on top of a hill in Mar Vista overlooking the beautiful landscape of the Los Angeles basin. My yard is filled with plants, succulents, flowers, and trees. The studio is my sanctuary. I don’t pressure myself to paint, but I try to do one thing per day for my art. Some days I get up early and go out to my studio to have coffee with my paintings. Creating is like making a baby. It takes time to conceive and gestate Ideas into form. Much like babies, art goes through rapid growth spurts and times of slower development. I have done Julia Cameron’s book “The Artists Way “about five times over the past 15 years. Through her methods, I have learned to be kind and patient with the creative process and to push through artistic blocks with little exercises like taking artists dates, going to concerts, practicing meditation and visualization, writing morning pages and observational drawing to get the creative juices flowing. My work is colorful and painterly with a strong drawing element. I didn’t go to art school, but I studied privately for decades with several local female artists Ilana Bloch, Elizabeth Kelly Erickson, and Ida Morgenstern. Thank God for my artist mentors, they gave me technical skills while encouraging me to be creative and find my own style. All of them push me to draw. I would always rather paint then draw, but the discipline of drawing has made me a better painter. Drawing has taught me how to see and observe everything in life through a creative lens. Some days I get on a roll and spend all day in the studio. Painting for hours on end can be lonely, but my kids and art-loving neighbors come by to cheer me on. I love to paint with other artists at my studio or in a workshop type setting but most of my painting over the last few years is at my studio. Painting is an intuitive, physical, emotional and spiritual exercise for me. I am working on big pieces now, so I am throwing my body into it moving up on ladders, lifting the work onto the floor, pouring and moving paint on huge surfaces with big brushes and tools. I work on canvas, wood, and paper using acrylic paint, collage, lots of charcoal and pastels. I always have music playing, it is the backbeat behind many of my gestural lines and shapes. I start with a warm-up, some drawing, journaling, listening to music, or meditation and I listen to my intuition to inform me on what to do next. Sometimes I step back and just sit in silence a look at my work and write down ideas, feelings emotions or visualizations. This repetitive process, along with daily meditation, develops the observer’s mind. If something is bothering me, I will go out to the studio and take out all my anger or frustration out on the canvas. Most of my work comes from a struggle that I dare to face, express and resolve. To me, it is beautiful to get honest and vulnerable and to be courageous enough to face things head on. Art gives me a place to wrestle with my inner demons. This is how I created “ Nurse” a painting about the pain and frustration of watching others neglect to take care of themselves. I love to work on themes of inner struggle in series. People really relate to transforming hardship into strength, and I get as much out of watching people react positively to my work as I do in making it. So thank you, for giving me the opportunity to share my story with Angelinos. Most people move to LA to get discovered. I ended up coming here to discover myself as an artist. I am continually inspired by the beauty of the Los Angeles landscape and eclectic culture of artistry this city has to offer. My work seems to evolve and tell a story of my life here. I did a series in 2015 entitled “Patterns in Bloom” which was all about emerging and reclaiming inner strength after the pain of divorce. 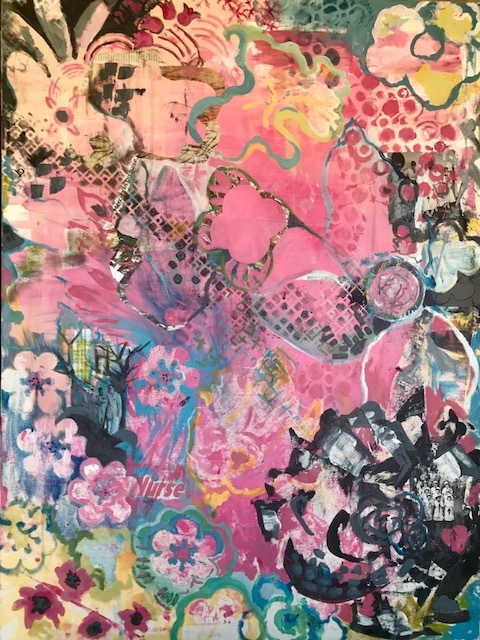 I returned to Los Angeles from a business trip to Vienna with a renewed courage to break out of my old “patterns” of painting and to “bloom” into a more authentic artistic voice. 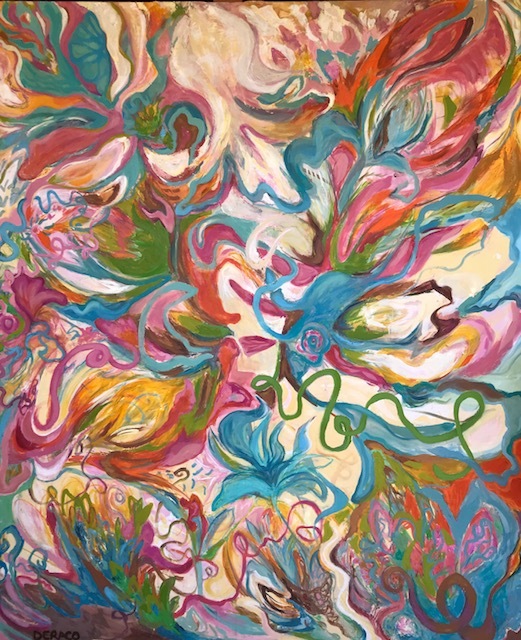 Inspired by the floral motifs, curved lines and patterns of the art nouveau the subject matter for this series arose spontaneously and created a ‘beautiful and colorful chaos’. My journey to resolve each piece unfolded similarly to the way I moved through divorce and the other complexities of life. I step back, pause to gain a clear perspective while creating meaningful connections and restful places. 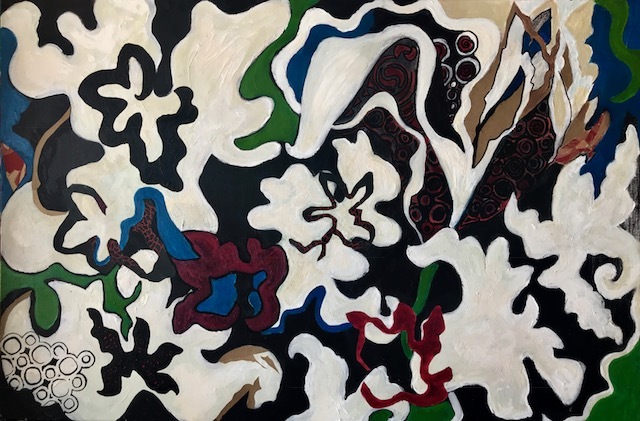 My intention was to tell a beautiful story of self-discovery, growth, and transformation through stylistic interpretations that connect the simplistic elements of nature, pattern, design, and color. My most recent series, “The Truth is My Name” is a symbolic depiction of the unraveling of truth regarding gender inequity and abuse that is the backbone of the Me Too movement. A pervasive culture of male sexual violence against women and children, scandals in our churches, corporations and schools and the hidden truths that bind us to societal norms that no longer serve humanity. Like many victims of these gender-biased culture wars, the events of the last few years brought up dark memories that needed to come out and to the surface. In a world filled with stressful, toxic events, to watch woman rise up in their power has been the most inspiring time in my artistic life. The end game for my most current series is to ride on this invigorating wave of the consciousness of truth, heal the past through creative expression and share in the beauty of this collective transformation. I have always been drawn to shapes of the floral figure as a symbol of the power of the feminine so I sought out to find the one with the most powerful meaning. In Buddhist tradition, the Lily flower is a symbol of courage and the expression of aggressive female emotions. In Greek mythology, Goddess Hera is said to have created the lily flower in a passionate expression of rage. In many religions, the lily is a symbol of fertility and resurrection. In some traditions, the lily is believed to have medicinal properties that cure diseases such as depression and toxicity. The series started two years ago with personal commitment to daily observational writing along with repetitive drawing of the lily figure. I decided to start with charcoal to symbolize the expression of dark pent up emotions. The drawings eventually morphed into loose and explosive paintings that symbolize the unraveling of dark emotion into the beauty of transformation. I chose to focus strictly on the lily figure as a symbol my fidelity to the courageous mother archetype within me and those around me and that have the courage to express painful and aggressive emotion. 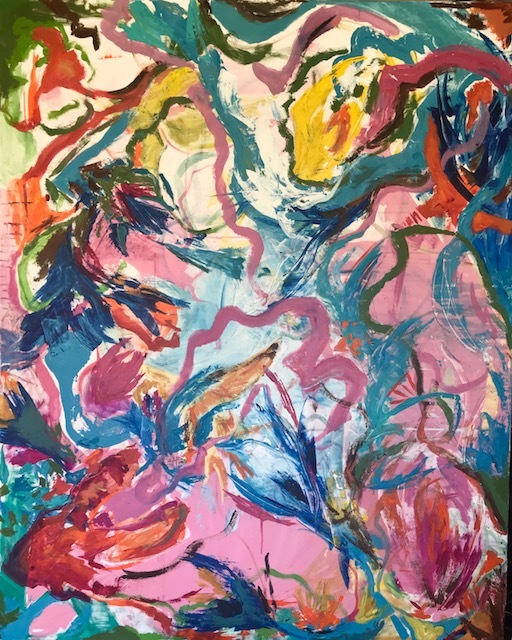 As survivors continue to come forward and tell their stories, more paintings flow out of me (much like Hera’s expression of rage that rained beauty onto the earth). 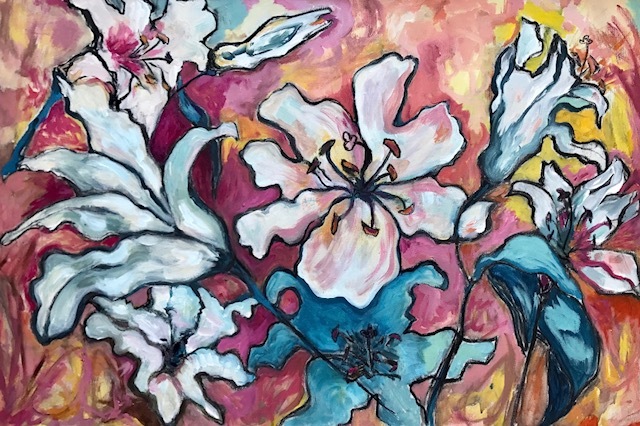 While creating this intuitive painting series, I feel like I have become one with the lily, its powerful symbolism, its healing nature, and its sensual, lyrical lines. In borrowing the bold language of the lily flower, to heal and express a collective pain, I feel I have shared a newfound collective feminine voice that will transform an era. Like the joy my father’s music used to bring to our community in upstate New York, I hope my work brings peace and healing to others. I feel successful as an artist and a human when I am growing technically and expressing my own authentic and inventive style. To be able to express my beautiful, complex and sometimes chaotic life in LA with its struggles and transformations is the most fulfilling accomplishment. Don’t quit your day job unless you have a financial sponsor. The cost of living in Los Angeles is high, and you need to take care of yourself. The best thing you can do is get out of your studio every day and into the world. Get out and inspired and make connections. Stay grateful for any way to make money that anchor’s you to service to our enormous artistic Los Angeles community. Make business cards with your paintings on them. Tell everyone you know that you are an artist and show them pictures of your work. My biggest collectors are people I have met through my professional life or through my friends and family. Most of my friends that are working artists have day jobs or work in the art industry. Hey, you need money to eat, buy paint and pay your rent. Once you have your basic needs met, you can be free to create. Don’t waste time and money on things that aren’t in alignment with your goal to be an artist. If you go out, go to galleries and art shows with your mentors, other artists or collectors. Hang with writers, poets, musicians anyone that inspires and supports you. Eat at home and shop at Trader Joes it is healthy and cheap (that’s the nurse in me that said that). I don’t buy expensive bags, cars, clothes or stuff so I can have an art studio, go on vacation once a year and feed my family. Every time I sell a painting, part of the money goes to buying new supplies. I stock up on art supplies during sales and watch out for coupons. I have a friend that reminds me to “paint like you are a millionaire” (without poverty consciousness) because the highest quality of consciousness, and art materials, yield the highest quality work. People can support me by contacting me for a studio visit or following me on Instagram and Facebook. You can contact me via my email, website maryrosederaco.com or Instagram maryrosederaco.com. Yes, this article made me cry. Mary, your ability to write is as great as your art. I’m extremely proud of you. Love from your mother. Kudos! Mary Rose – beautiful work from a beautiful person. As someone who has known you for many years, I can see the transformation in your work and in your prose. I’ve had the pleasure of working closely with many artists in my life, and I’m pretty sure none of them could provide such an open, honest and introspective account as you did when asked about some background on your work. 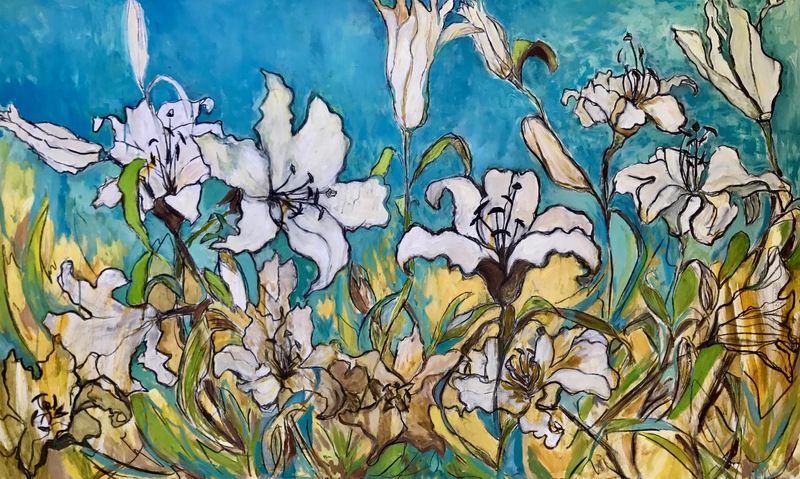 That blue and gold lily study is my favorite, and evokes the same sense of freedom, adventure and excitement you seem to reflect and engender in others you touch. Let’s catch up soon! “The end game for my most current series is to ride on this invigorating wave of the consciousness of truth, heal the past through creative expression and share in the beauty of this collective transformation.” To me, this excerpt gets to the essence of your beautiful artwork, life, energy and effervescent effect on those around you. Mary Rose you are such a pure light. You shine your light those who you come in contact with through your art, empathy, service and your overflowing joy! I am so impressed by your clear undrstanding and articulation of the throughline of influence of your artistic development. Thank you for sharing yourself, your process and your beautifully inspirational work. You are showing each of us that the joy of living into our own creative life is truly accessible if we just show up each day with gratitude and action steps. Thank you for spreading the joy that inspired wonderment in you from such a young age! A born artist, you are making the world a better place for all of us. Thank you for being so full that you overflow. I wish you every continued success, I am so grateful to continue to co-inspire and dance this crazy, colorful, vibrant, artistic life with you and our whole art community! Mary’s art took my breath away and I am the proud owner of two amazing pieces. I also gave two pieces to my best friends as treasured art. Seeing her art nearly every day in my law office nourishes my soul. My clients also find her work to be spectacular. I am so glad her work is in my life.